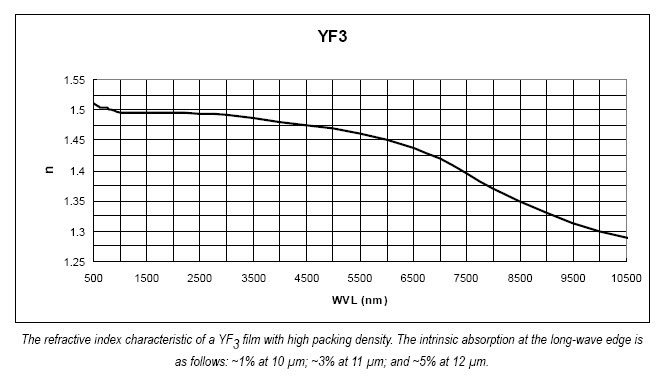 Yttrium fluoride, YF3, produces low-index film layers that exhibit good transparency in the UV through infrared regions. The films are insoluble and show low stress, making YF3 a useful substitute for ThF4 in many IR applications. It can be combined in multilayers with other fluoride compounds and with higher-index ZnS and ZnSe layers for AR and filter coatings out to wavelengths >10 μm. Its absorption at 10.6 μm is low, but limits its use to laser applications that do not require the highest damage thresholds. Yttrium Fluoride films can be deposited from the melt by resistance-heated or electronbeam evaporation. Film density and refractive index increase with substrate temperature. Thicknesses greater than 2 μm will adhere to zinc sulfide, glass, and Germanium substrates heated to 250°C. Yttrium fluoride is insoluble, therefore making it suitable for humid conditions when applied hot. Water absorption bands of depth 2-5% are present at 2.8-3.2 μm and 5.6 -7.3 μm on colder substrates. When used in multi-layer combination with ZnS or ZnSe, the substrate temperature must be reduced to ~175°C to avoid the low sticking coefficients that those materials exhibit at higher temperatures. Amorphous films exhibiting low scatter can be deposited below 150°C substrate temperature, but adhesion and refractive index properties are compromised. Above ~250°C, the films become crystalline and harder, but they exhibit noticeable scatter and are more highly stressed. By E-beam: Melt material with a low power sweep until spitting and outgassing subside as a rate of 1Å/sec is approached (~15 min). Increase the power gradually to form a uniform melt before opening the shutter. By resistance heating: Using a baffled box source that has a perforated top (similar to ThF4 procedure), fill and heat to gradually approach evaporation temperature. View more about Materion thin film optical coatings. We offer multiple particle sizes for evaporation as well as sputtering targets. To view items, please visit the Materion online catalog. If you require a custom manufactured item, please CONTACT US. This information and our technical advice - whether in writing or by way of trials - are given in good faith but without any warranty, and this also applies where proprietary rights of third parties are involved. Our advice does not release you from the obligation to check its validity and to test our products as to their suitability for the intended purposes and uses. The applications, use and processing of our products and the products manufactured by you on the basis of our technical advice are beyond our control, and, therefore, entirely your own responsibility. Our products are sold in accordance with our general conditions of sale and delivery.